Dogs’ paws pads aren’t resilient to hot surfaces like our shoe-covered feet. 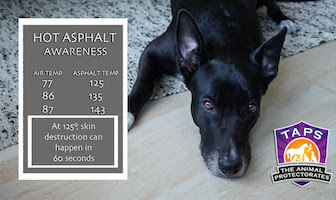 Their paw pads can be permanently damaged when exposed to scorching surfaces. Freya put together this short video to show how to care for her and her doggie friends on hot days. You can view that video here. This entry was posted in News and tagged dog safety. LaVonne Lawson is our Latest Featured Speaker! Sean Matsler is our Latest Featured Speaker!